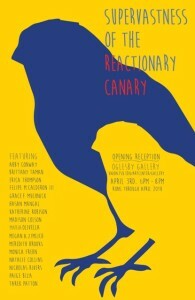 Supervastness of the Reactionary Canary is a Print+Media Exhibition. The opening reception will take place at the Oglesby Gallery on April 3rd, 6pm-8pm. The exhibition will run through April 20th.